Cliff House, San Francisco, Ca. 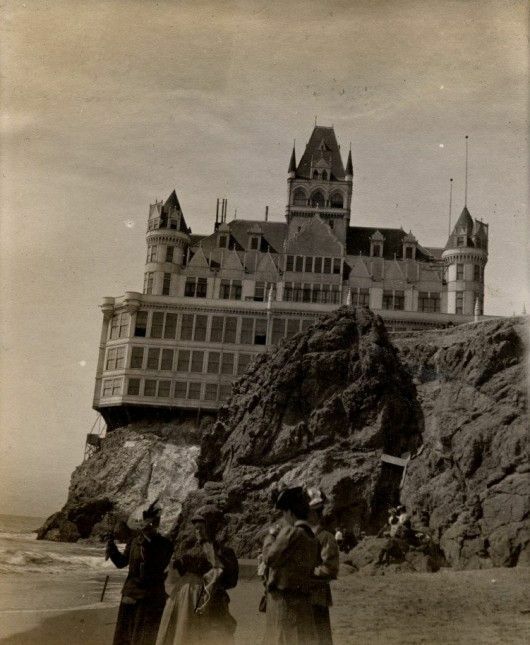 The Cliff House Ghost Lady. This is the story of Natalie Selina Harrison a young woman who was in love with Sean Eric Anderson, who was born in 1897 and died in 1917 while fighting in Germany during World War I. When Sean left to fight the war he promised to return and marry Natalie. Natalie stood on the rock island near the Cliff House and promised never to move until her love returned. Even though Natalie and Sean are both deceased, It is said Natalie still awaits Sean's return. Anyone can see the statue today and according to witnesses, Natalie's ghost has been seen at night during bad weather. Natalie's spirit doesn't like crowds of people but she infamous for luring men to an untimely demise. The legend goes, many men are either missing, dead, or mentally unstable due to her interaction. Scientists have been unable to confirm the existence of Natalie's ghost, nor able to find her body, but the stone statue does contain human DNA. However, autopsies were able to prove the deaths of several men. These men died from drowning in the Pacific Ocean or falling off the cliffs to their deaths. Only a few men have survived Natalie's ghost but they are unable to explain the exact details of their incident.